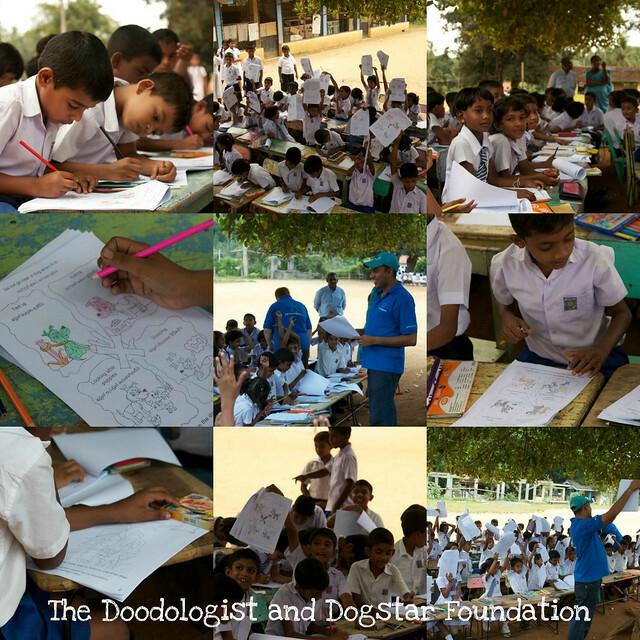 This project, in a nutshell, is about Education and the charity that came up with it, is The Dogstar Foundation, which is a very small charity based in Sri Lanka. The charity has a opportunity to reach out and educate children alongside the main work that they do, which is to sterilise and vaccinate dogs (and cats). How do you engage children long enough to get an important message across? 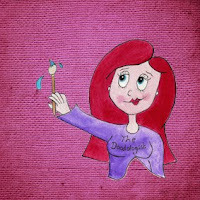 This is where I came along, producing a doodle colouring book that was not only fun and accessible for children, but also carried a serious message. A very challenging idea to put into doodle form, but immensely fun too. Teaching children how to interact with animals safely in a country where Rabies is present, saves human life’s and makes the community safer for everyone ( 2 and 4 legged). In March 2012 ,Dogstar delivered our first education sessions for 100 children using our new "Be safe , be kind , be a dogstar" bi lingual ( soon to be tri lingual ) workbook and colouring sheets. During the interactive sessions the children role play , answer questions , colour and talk with the presenter about their own animals and experiences. We discuss animals basic needs , promote positive handling and interaction , bite prevention and what to do if you are bitten. At the end of the session each child signs a pledge to "be a dogstar" look after animals , be kind , be safe and if they are bitten to tell an adult and seek medical help. These sessions have been so successful that the local Medical Officer of Health who attended a session at a Temple in April 2012 has requested that we provide 2000 copies to be delivered to 46 local schools in the Ranbukkana area of Sri Lanka. This projects needs £500 £410 £390 £295 to get off the ground, not a humongous amount, but substantial for a charity of this wee size. There will be lots more photographic and doodle updates on this project soon! The most important thing at the moment is getting the workbooks printed and in action. Aww thanks TJ, your support means a lot! In fact it means a HUMONGOUS amount. Have loved being part of this project, just hoping that it really takes off! OMG, Claire! How awesome! They chose the perfect person for the job. So proud to know you. I wish this project, and you, great success!! Thanks so much! Rather touched that people are excited about this project, wasn't sure anyone would even be interested, as sometimes I think people get overwhelmed by all the charity stuff thrown at them! This is very, very impressive - congrats to you and best of luck to The Dogstar Foundation! Thanks Linda, I think the work they do is impressive, not sure about the doodles yet! I loved doing it and it was a humongous learning curve for me.